As I’ve mentioned recently, I am joining in an Online Bible Study through Proverbs 31 Ministries. As part of my participation in this study, I am going to be joining in their Thursday BlogHop. Each Thursday I’ll choose one of the topics they provide and blog about it. I see future Thursday coffee times spent cruising the blogs of the other blog hoppers. For my first bloghop post, I have decided to share with you some of my Favorite Scripture. I remember this scripture was on a wooden plaque in my grandma’s house. The versus were engraved in the wood, and so as soon as I learned how to read, I would read them. I also remember my grandma helping me memorize these versus for church. If I’m completely honest with you, that would be part of the reason this is one of my favorite scriptures in the Bible. The woman who taught me about Jesus, and prayed every night with me, was the same woman who had this scripture hung on her wall for all to see when they came into her home. The more I mature in my faith, the more precious these versus are to me. 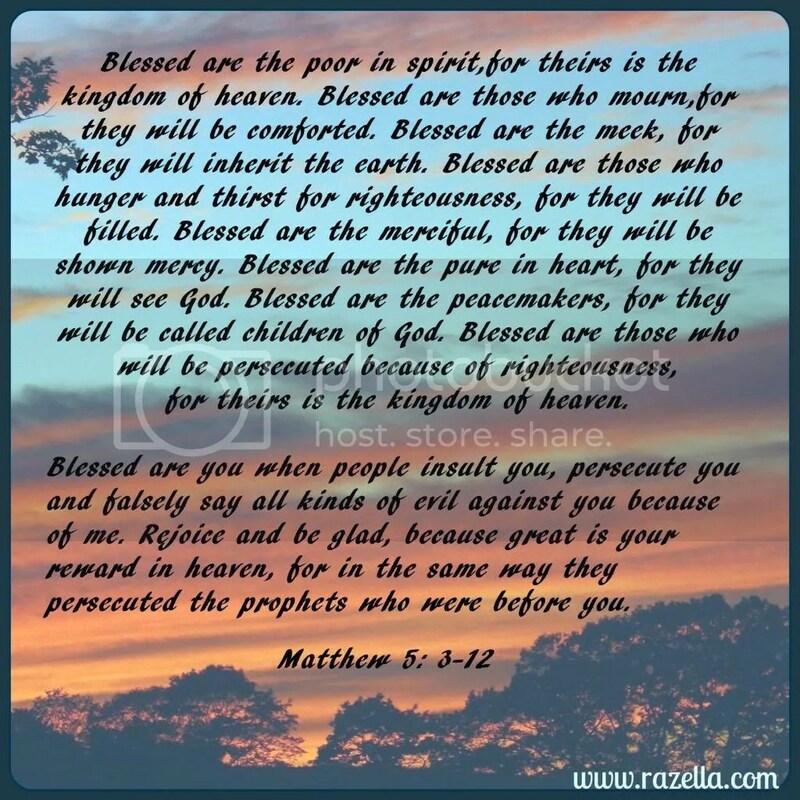 I remember a time when I focused in on the “Blessed are” part, because it was about me. If I do THIS, then I will be blessed. I didn’t think about what that blessing might look like, or how the blessing might work. It was about “me getting blessed” for doing or being x,y,z. Now I read over these versus and see so much more. I see the call to be humble before God almighty. It is in humility we see God’s power, His sovereignty, His incredible love and grace. He freely gives us the kingdom of heaven as we humble ourselves before the cross, understanding only Christ could take on God’s wrath for sin, that we may be brought before Him blameless. I see in our storms, our grief, our darkness, those who have faith and know Christ know a comfort that is truly living hope. His Holy Spirit comforts us, helps us, takes all of our hurt, pain, and anger, and breathes His own spirit into us that we may know a comfort and peace that transcends this world. A comfort and peace that gives us rest and perseverance as we wait out the storm. He holds us tightly until the seas die back down, and through this, we see and know His glory and righteousness. I see that as we learn to bring our strengths under the authority of God, submitting them to be used according to the will of God, we are blessed through His provision in our lives. We become co-heirs with our Lord and belong fully to a God who loves us. I see that as we seek His wisdom and His will above our own, He is faithful to fill us with Himself. He gives to those who seek and answers those who ask. He makes us whole within Himself, giving us a new mind and heart that transforms us to look more like His son, our Savior, who shows us love in the most perfect of ways. I see as we come to realize we all fall short of God’s glory, as we come to realize who we are in comparison to who He is, we find ourselves able to forgive and show His love, His grace, His mercy to others. What a blessing as we experience giving this in our lives, we experience more deeply drinking it in, into our very souls His mercy, His grace, and His love. I see that faith, trusting in God to be who He says He is, stands up against all this world may throw at us. This temporary time and place is exactly that in light of our eternal hope, our living hope, found in Christ. I see the reality that whatever others may do to me, however badly others may try to treat me, or hurt me, all because of who I am in the one true living God, is nothing in comparison to what God gives me. How He loves me. How He has saved me and cares for me and transforms me. I see that when others may turn against me, or shun me, or intentionally try to tare me down, I’m not alone in this. I see it’s not an attack against me, it’s an attack against my Father, as many have been attacked before because of who my Father is. I know my Father is victorious. I am called to rejoice in such dark times because my eternity is not to be spent in darkness, my eternity is to be spent in light with my Lord and Savior. Darkness here is only temporary, and as I follow Christ, even in dark moments I have within me a light that can not be put out. As I grow to know the Lord more and find myself Craving God more, I read these versus that have been stored up in my heart since childhood, and see it’s more than about me getting blessed. I see my Savior, His Glory, His Sovereignty, and I begin to glimpse that it is He who is my blessing, and I find myself so thankful for that. I don’t see the scripture… but this was fun reading & trying to figure out what scripture it is 🙂 haha! Oh… when I refreshed, it came up! 🙂 It was like a quiz & then got the answer! I am really looking forward to this study. I am also getting to know some (or all) of the bloggers. I love that scripture. My grandmother has it on her wall as well. Have a great week. I am TOTALLY joining in!! 🙂 Thanks for making sure I heard about it! I already have the book, but need accountability to actually read it all the way through. It’s hard/good, if you know what I mean! Love your verse and the sweet story behind it! May God Bless you as you journey through Made To Crave. Thank you for sharing. Very nice! I loved this part, “We become children who love our Father so deeply, so truly, we not only run to the door to see Him, we bring our friends so they may see Him too, knowing our Father’s love is grand enough and great enough for everyone”. How awesome is that?? God is so good. Thanks for sharing your special grandma moment with us.